Speakers inspire, inform and educate. When your audience leaves, do they have something they can immediately do differently or better? Audience participants want maximum value for the time they spend listening to speakers. They need to know that they can actually do something with the new perspective the speaker has given them on the issues they face. For over 15 years Alan Kay has been inspiring people to do something different through his speeches and workshops. His approach is based on a methodology that is deeply researched and widely practiced. Alan has taught adult business students in many different contexts so he knows a few things about how adults learn. His content is focused on learners and their goals producing better outcomes for the audiences he works with. Alan Kay of the Glasgow Group is a Solution Focused change management specialist in organizational and people strategy. Formerly managing director of a marketing & communications business, Alan’s clients cover a broad range of sectors. 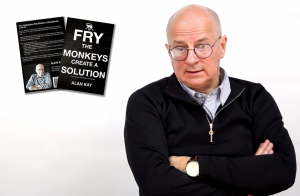 Alan’s Solution Focus work includes a number of proprietary approaches featured in a variety of books and journals. He teaches executive development students at Schulich School of Business and at the Canadian Marketing Association. Why the book is thin? © 2019 The Glasgow Group. All Rights Reserved.